It's a been a bit since my last post; I can't wait to tell you everything thats going on! I'll start by talking about our annual Winter Camp that we have at Sky Ranch in Van, Tx. On MLK weekend from Friday to Monday, we had around 700 students at campuses across the metroplex join us for worship, learning, and fellowship. We flew in some great campus ministers from Washington state who we have known for years and who have helped enrich our ministry in countless ways. They spoke about what it mean to be sent by Jesus, and what it should look like to live outwardly focused lives as disciples. They knocked it out of the park. Our students were challenged and encouraged, leaving camp with a newfound desire to reach their campuses and get outside of their normal habits in order to love people well. It was a great weekend! Below is a picture of the Collin students we took to Winter camp. We had around 150 go this year! Our Spring meetings and small groups have kicked off as of two weeks ago and they're full-steam ahead! The last two weeks at Thursday Night Focus have been full of new students who are eager to make new friends and find out more about Jesus. We started a sermon series last week on the Word of God which is aimed at helping our students learn more about Scripture and considering his words to us. The students have responded in a big way and are eager to learn more about where we got the Bible from, who wrote it, and how we should interact with it. Exciting stuff! Outreach continues to go well at all of our three campuses, especially at Central Park in Mckinney. We just started at this campus last semester and we've seen some immediate fruit. God's certainly working there. We have a co-ed small group thats seen some new folks who have had an immediate impact on our community. It's been so cool to see God work there, and Cody McCarty has done an awesome job heading that up. 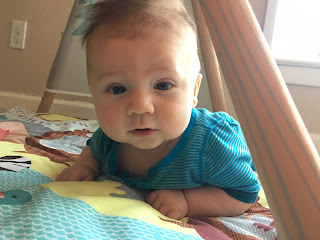 On a personal note, being a full-time minister, part-time professor, and new dad has had its challenges but it's been overwhelmingly positive. Erika is back at work part time and I have Jack with me for about 18-20 hours a week. He comes with me to meetings, one-on-ones, and other ministry events and he's been so good. What a sweet blessing that I get to do God's work with this little guy. Please continue to pray for our communities, for us as ministers, and for my family as we do our very best to bring the Gospel wherever we go. I pray for you all often and I can't tell you how thankful I am for your love and support in this mission. Thank you!